Wasp, Hornet & Bee Identification. If you suspect that you have a wasp nest, the first thing you must do is identify that they are indeed wasps and not a similar type of insect, for example, bees. 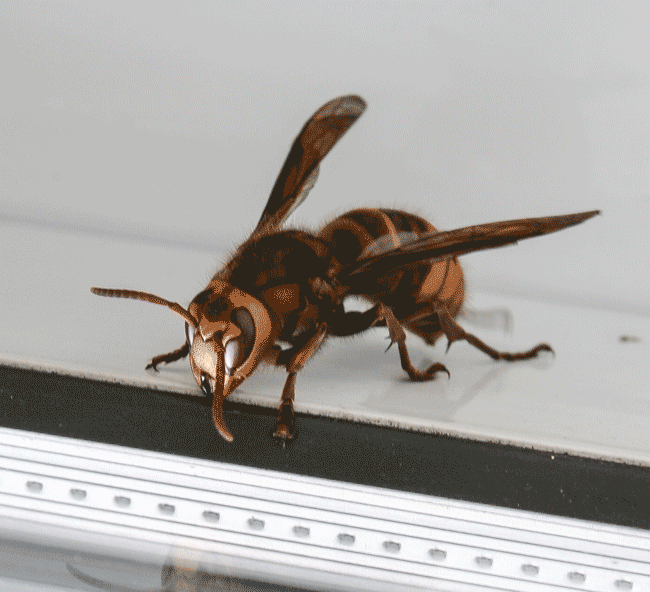 We understand that it can be challenging to distinguish insects of comparable size and appearance, so we have included a photo and video guide to help you compare the visual, behavioural characteristics and more importantly the differences between Wasps, Hornets and Bees. Compare the difference between a Wasp, Hornet and Bee. 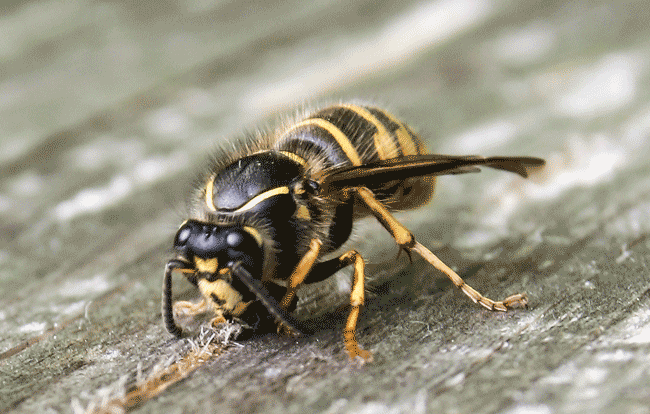 If you can take a close look at your suspected wasps, you will very quickly be able to identify if they are indeed either wasps, hornets or bees. The photos below illustrate the physical distinction between the four leading contenders. Numbers: Slowly building in spring from one to high 100's/1000+ later in summer. Size: Approx 18mm in length (size can vary). Favourite Location: Roof spaces (lofts) but can be anywhere, even holes in the ground. Flight: Fast flight in straight lines. Little to no clustering at the nest entrance. Noises: clicking, tapping or scratching emanating from within the nest. Return to nest carrying insect parts in their mouth. Numbers: Slowly building in spring from one to 100+ later in summer. Size: Approx 25-35mm in length (size can vary). Favourite Location: Roof spaces (lofts) sheds and hollow trees. Flight: Fairly slow flight in straight lines. Nocturnal activity. Can often be heard hitting against windows at night time. Favourite Location: Chimneys in residential housing. Holes in hollow trees. Size: Approx 15mm in length (similar size to wasps). Flight: Fairly fast flight, long back legs hanging down when flying. Clustering at the nest entrance. Noises: High pitch buzzing noises from the nest. Can sound like a roaring noise when in chimneys because of large numbers of bees present. Visible pollen on legs when returning to the nest. Numbers: Slowly building in spring from one to between 50-100 later in summer. Size: Approx 20mm in length (tree bumble bees are smaller). Flight: Fairly slow flight and fly around in circles. Gather at the nest entrance. Noises: Make loud squeaking/chirping and buzzing sound when in the nest. Large, black, fluffy and noisy. You will know when you have a wasp or a Hornet nest when you see a constant stream of wasps to and from the nest. Our videos, show real-world examples and will help you identify if you have a Wasp nest, Hornets' nest or a colony of Honey or Bumblebees. A Wasp or Hornet nest will resemble Heathrow airport, one lands, one takes off, think of us as traffic control. Wasps do not generally hang around the nest entrance for too long (a busy nest will have wasps queuing up to get in) as they are on a mission with no time to lose. Bees will also cluster around the entrance to a nest and bumblebees, in particular, will fly around in mating flights outside the nest entrance, but not in a determined manner as wasps. The guaranteed way to determine an active wasp nest is not so much them going in, but more so the way they leave the nest. Wasps will exit the nest in the manner of a firework going off. They have delivered their catch to the nest and are now eager to be off hunting. So watch out for that hasty departure, this is the key! When do wasps make their nests? Queen wasps start building their new nests in the spring (they never re-use old nests from previous years). There are no worker wasps about at this time of year. Queen wasps emerge from hibernation when the temperature rises. Usually from mid-March onwards, but this can vary depending upon the weather. In average years you will start to see (small) active wasp nests from the end of May onwards. Of course, there will be some earlier ones and likewise some later ones. The geographical area can make a difference as microclimates influence temperature. It is relatively difficult to notice the activity of a single wasp, so it usually pays to wait until the queen has reared some worker wasps before searching for nests. Our advice is to wait until mid-June before searching for new/active nests. When looking for activity, go outside, stand for ten minutes on each side of your house and scan your roof, pay attention to the gutter areas, lead flashing around chimneys and vent pipes and any other obvious access point where wasps might enter. Activity can be seen focused in one area. If you notice activity in more than one area, this indicates that you have more than one nest. Mid-June onwards there should be enough workers present with increasing activity and enough "traffic" to and from the nest for the nest location to become evident. At this point, you will see a steady stream of insects leaving and returning to the nest entrance. Late summer when numbers of worker wasps equal hundreds (possibly thousands), they will be visible and you cannot miss them. The question to ask yourself is "what can I see?" Video of wasp nests to help show you what to look for. We have put together a short video to help you identify if you have a wasp nest. In the video you will see four separate wasp nests; the first nest entrance is on the side of a chimney where the wasps (common) are entering into the roof space through an opening next to the brickwork. The second nest entrance is a small gap in the lead flashing and the wasps (also common) are gaining access to the void in a timber frame wall. 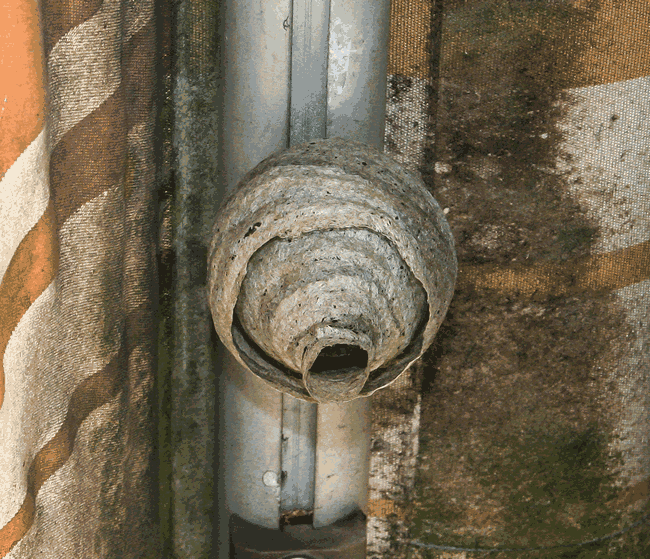 The third nest occupants (common wasps) are entering a roof void using gaps under the tiles. The fourth is a German Wasp nest built in a bush. Take a look at our second video to help you identify if you have a wasp nest, it will hopefully give you some idea of what to look for. There are shots of a German wasp nest in a bush, a wasp nest in the soffit of a house, a wasp nest in a loft and finally a wasp nest in a shed wall. 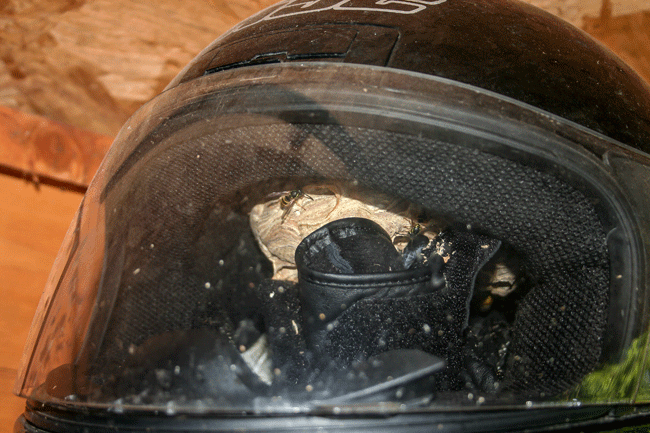 Take a look at our third video to help you identify if you have a wasp nest. The video also shows various wasp nests in differing locations. You will see a rather large "busy" common wasp nest, minutes after treatment, the insecticide hasn't started to work yet. We have shown this activity to illustrate just how dangerous it can be (if unprotected) when "stirring up a wasp nest". This hyperactive response to interference to the nest is an excellent example of how some people can get into bother when trying to eradicate a wasp nest with DIY methods. 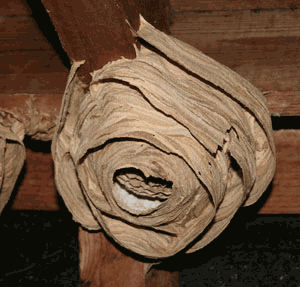 How can I tell if a wasp nest is active? During the spring when wasps start building their nests, it is sometimes difficult to know if a nest is old (last year’s nest) or if it is a new one that is under construction. 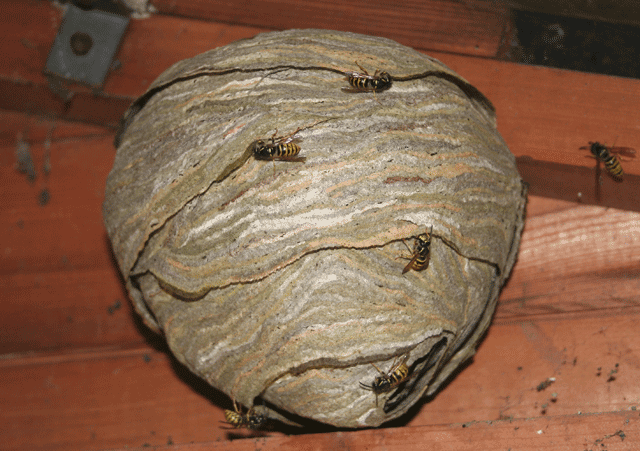 Some guidelines: If you have found a wasp nest in the spring and it is larger than a football with no live wasps walking about on the outside of the nest, it is most likely that the nest is an old one from a previous year. If you find a golf ball size nest in the spring, watch it for 10 minutes or so and see if anything returns to the nest within this time. If a wasp arrives at the nest, it’s a new one and is “live”. 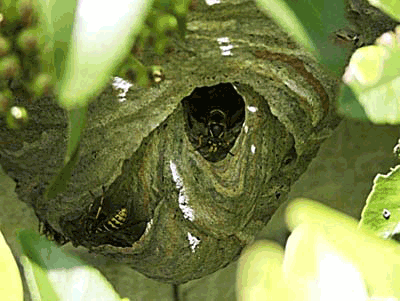 As the nests grow over the spring and early summer months, there will be more wasps emerging, and by mid-June, most nests will have wasps walking over the outside surface of the nest as they repair and expand the nest size. Old nests usually look “old and tatty” whereas a newly built nest looks bright and fresh. Please remember that nests grow at different rates, some nests are far more advanced than others. When dealing with nature, there are always extreme cases. Wasps and Hornets build their nests in various (sometimes awkward to reach) places, most usually in loft spaces, but very often in garden sheds, air bricks, behind tile hanging and just about anywhere accessible and dry. They also build their nests underground, in old rabbit burrows or even mouse or vole tunnels. They do tend to prefer loft spaces which are warm, dark and undisturbed. But on occasion, they nest in exposed locations. It is worth noting that wasp nests are not always in the shape of a ball (round). They can build their nests to fit any form, very often the nests are flat and spread out, for example, they can create their nests in the cavities of walls, the nest then fills the void, and the wasps build the nest within the space available to them. Very often we get asked, “Why do I get a wasp nest every year”? There is an easy answer to this question: it is often geographical. Some areas are better suited for the wasp than others, its as simple as that. It is not personal, and you are not a target for harassment. If you have a wasp nest in your loft year after year, it just means that wasps have easy access to the roof space and it is dry and warm in your loft. The same can be said for sheds or just about anywhere else that they decide to make their home. Leaving a wasp nest to mature (release new queens) in the autumn can also lead to a high number of hibernating queens in the area, raising the possibility of another nest the following year. If you start to see dead wasps inside your house regularly, this is a sure sign that there is a nest close by, most probably on your property or your neighbour's property. 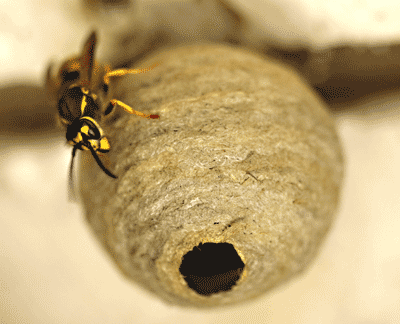 To locate the nest: inspect of the outside of your home paying particular attention to the roof and fascia areas, air bricks or any gaps where wasps could gain entry into the building. German wasps build their nests in trees, bushes and hedgerows. You cannot go wrong with German wasps. The nest will be in a bush or tree and will look like a grey ball type structure attached to a branch. The nest can sometimes, however, be very challenging to see. The majority of other types of wasp in the UK are small parasitic wasps which pose no risk to humans. There is another type of social wasp, the "Median Wasp" but these are quite rare. 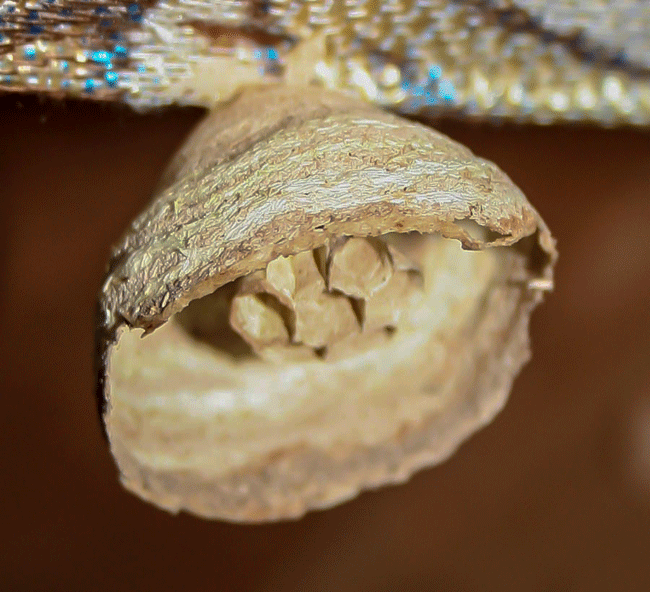 The nests are similar to other social wasps but have an entry tube at the bottom. Please be sure that you have identified that your problem is in fact wasps or if you have found a nest that it is an active nest, we don’t want to waste your time or ours by attending an empty wasp nest or worse still, a bee nest which we will not treat. 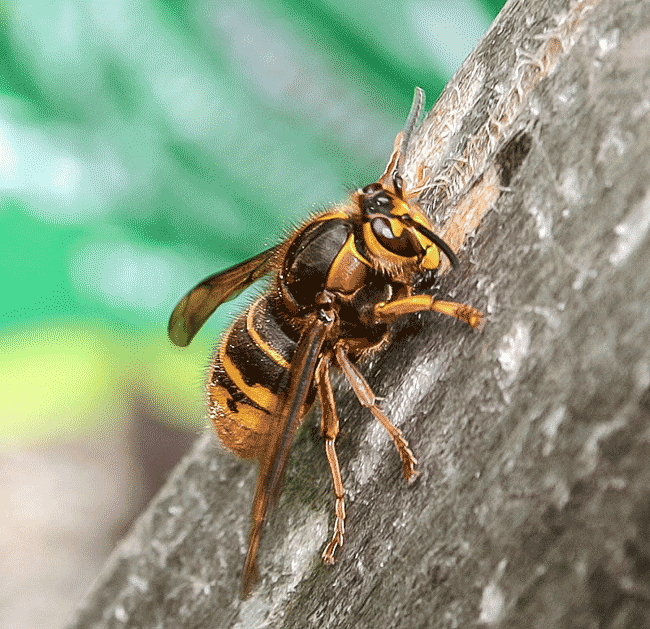 Both Wasp and Hornets nests are treated using the same method; take a look at our treatment page to see how we will manage your Wasp or Hornet's nest. 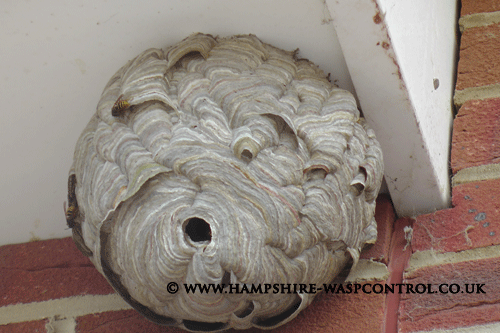 Once you are sure, you have an "active" Wasp or Hornet's nest on your property, visit our Hampshire Wasp area map to find out who covers your area. Or use our postcode search near the top of our pages. In the springtime from March until the beginning of June, you may see what appear to be larger than regular wasps. These are queen wasps that have emerged from hibernation and are starting to build new nests. Queen wasps are slightly larger (plumper) than standard worker wasps. From early June onwards once the queen has hatched some workers, she stays in the nest and the workers tend to her needs. At the end of the autumn you may see these larger wasps again, these are newly hatched queens that have recently emerged from the nest, mated and will hibernate over the winter. Once newly hatched queens emerge from a nest in the autumn, they will never return to it. They are individual insects which are attached to no nest or colony. Please note: If you have a nest treated in the autumn and queens have already emerged, the treatment will not kill these queens and you can potentially still have live queen wasps in the area where the nest was. The emergence of queens in late summer/autumn varies from year to year. Some years it happens in August, other years it can happen in late September. If queens have emerged before you have had a nest treated, there is a likelihood that some of them will find their way into the house if the nest was in your loft or another part of your home. They are attracted by light and can fit through the smallest of gaps. I have a wasp nest! It may seem ridiculous, "of course I have Wasps," you say, but many times a caller will say “I have a swarm of Wasps in my garden”. Wasps do not swarm, if you have a swarm of what appear to be Wasps, please take a second look, they are probably Honey Bees. Please take a moment to watch our bee video; it shows how bees swarm. If this is the case, then you will need to arrange for a local beekeeper/beekeeping association to come and collect your swarm and re-home them. You will play a part in helping to save our native Bee colonies. Honey bees are notorious for swarming into chimneys! 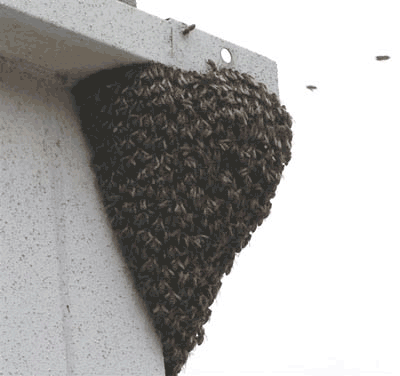 If one day (out of nowhere) you suddenly have bees coming into your house via the fireplace, this will be a honey bee swarm that has taken up residence in your chimney (you will be able to hear them up the flue). Again, you will need to contact your local beekeeping association for help and advice. Please note: before honey bees swarm, they send out scout bees to check out potential nest sites. If you have a few bees just looking, you will need to wait until the swarm turns up before someone will attend to remove them. Usually, scouting starts with just a few bees. The second-day numbers can increase to 50+. The third-day numbers can reach several hundred. At this point the swarm is imminent. Swarm season varies depending on the weather and temperature, but in general, bees start swarming from mid-April onwards. It is quite rare for wasps to nest in chimneys. We only see one or two cases a year. 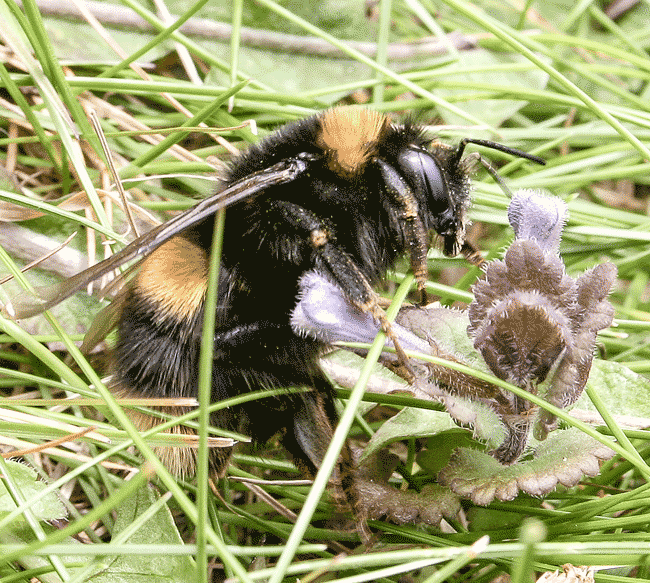 In spring, many people mistake bumblebees for wasps, in particular, tree bumblebees which are relatively new to the UK. Tree bumblebees (Bombus Hypnorum) like to nest up high, in similar places to wasps. If you have what you think is a busy wasp nest in April/May and it is at gutter height, you need to double check that it is not tree bumblebees. They are slightly smaller than other bumblebees but bigger and rounder than wasps. Often in May, mating flights can be seen, lots of males (usually 15-20 but sometimes more) hanging around the entrances to nests waiting for new queens to emerge and be mated. They fly around the nest entrance in circles. Tree bumblebees are often mistaken for wasps. Often we are asked, "why do we get bees nesting every year?" 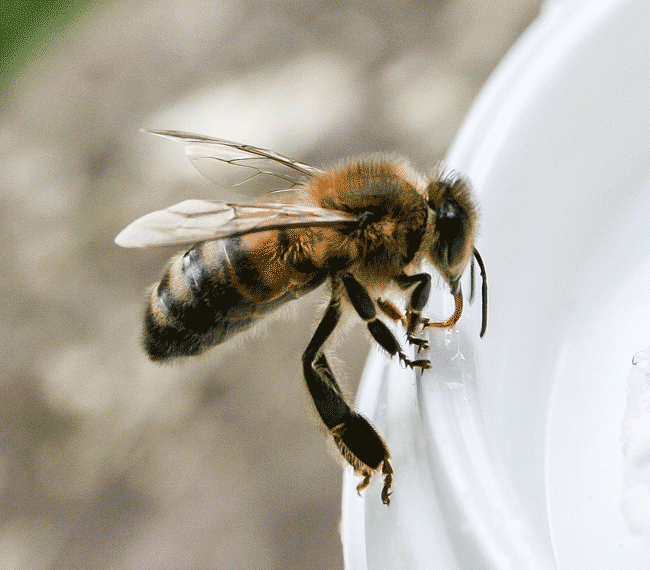 If you have honey bees nesting on or in your home every year, one of two things is happening! 1. You have a resident honey bee colony living permanently in your home, and they are healthy (surviving year after year). 2. You have a honeycomb located in your home, and each year a swarm of bees is attracted to this comb and its honey stores. Often, newly established colonies will die due to disease or some other factor. As illustrated in the pictures, bees will swarm around the nest entrance or the queen. 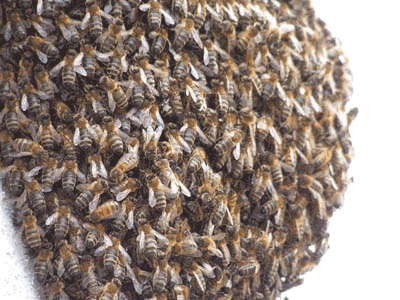 Sometimes these swarms will be found hanging from the branch of a tree or occasionally as illustrated in the photos, on the side of a building, the queen will be at the centre of the swarm as the workers surround her. 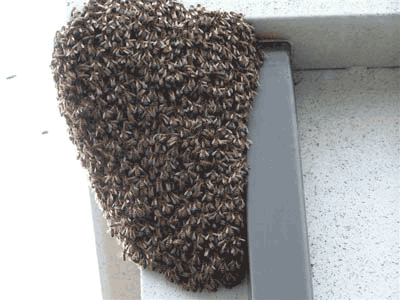 Wasps do not generally swarm in this manner unless the entrance to the nest is blocked up. Both Mason and Mining bees are solitary bees and are beneficial insects. 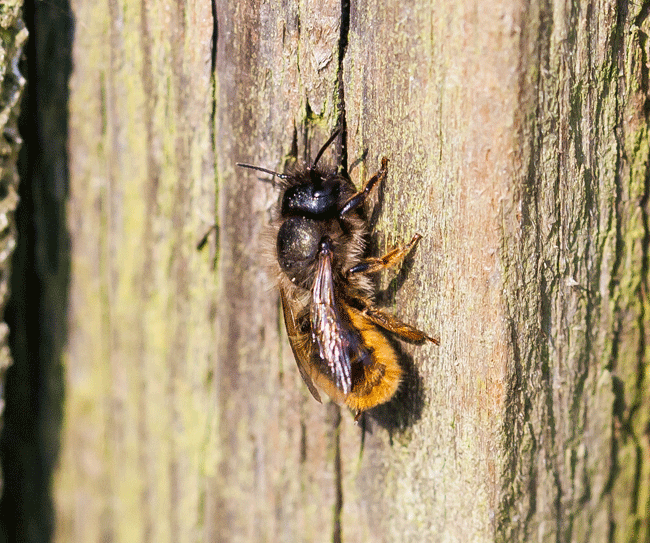 Due to their yellow/golden colour, Mason bees are often mistaken for wasps in early spring. The simple way to distinguish between the two is: bees are fluffy, wasps are bald. They are active in April and May for around six weeks. They prefer to nest in holes in walls, plastic weep vents in brickwork and even around the gaps in PVC windows and doors. They lay eggs which they then pack with pollen and mud. If you see an old hole or air brick filled with mud, mason bees are the culprit. Numbers of Mason bees are generally low, just a few, but in some years the numbers can be quite high, 50 or more at any one location. We suggest you leave them alone and let them get on with their most important duties. They will return the favour. Similar to Mason bees, mining bees nest in the ground, they make small holes which are slightly larger than wormholes with a small mound at the surface resembling a mini volcano. 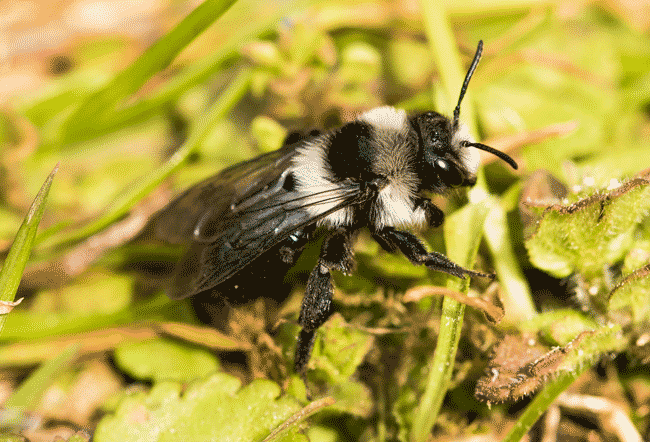 There are various types of mining bee which are active in the spring. Ivy bees are active in late summer and usually number in the hundreds. If you have a lot of small bee-like insects on your lawn in late summer burrowing into the ground it will most probably be Ivy Bees. We advise you to ignore them and leave them alone as they will soon be gone. Only female bees have an ovipositor, and both Mason and Mining bees are very unlikely to sting.